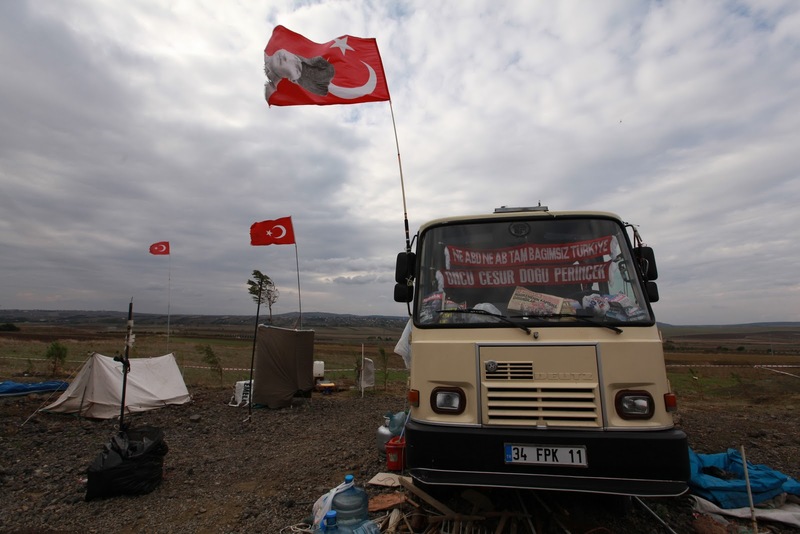 Protestors have set up a camp outside the Silivri courthouse to show their opposition to the ongoing Ergenekon and Balyoz trials. On Friday I travelled to Silivri, a seaside town a few miles outside Istanbul, to see for myself the ongoing trial of the alleged ‘Sledgehammer’ coup plotters. The sight of the courtroom alone was enough to make the trip worthwhile. It is cavernous: the size of a gymnasium, and can seat up to 180 defendants, dozens of lawyers, and hundreds more observers. It was purpose-built on the grounds of Silivri prison in order to accommodate these sprawling trials that are a defining – and controversial – feature of contemporary Turkey. To supporters of the Sledgehammer and Ergenekon probes, the building no doubt symbolizes the country’s determination to come to grips with the crimes committed by its once-dominant military, and the so-called ‘Deep State’. But as I’ve often written before, what interests me about Sledgehammer are the worrying and persistent signs that someone has fabricated evidence against the 200-odd defendants, possibly on a breathtaking scale. How extensive is this fabrication? Who carried it out? What role have the police played? What role has the judiciary played? These questions have received little attention. Around 150 of the suspects were sitting in the dock when I visited Silivri, presenting a sea of greying, balding pates. Almost the whole day was taken up by 30 or so defence lawyers requesting that their clients be released from custody. I have no way of independently evaluating most of these claims. But as I’ve written before, some of these examples have been very clearly documented. Throughout the day, the prosecutor and judges, perched close together on raised benches, listened in shifting attitudes of boredom. What struck me was the utter lack of vitality in the whole procedure. The defence lawyers knew perfectly well their clients would not be released. They also knew perfectly well that their arguments would not provoke a flicker of interest. And it was all played to a virtually empty press gallery. I know this trial has been going on for months now, but it still surprises me how little interest the actual proceedings are generating. Whether you see Sledgehammer as Turkey’s ‘truth and reconciliation’, or as a show trial orchestrated to destroy the government’s political enemies, you can’t deny that it’s important. But with one or two honourable exceptions, the Turkish media has utterly failed to even analyse the defence’s quite serious allegations of judicial and police malpractice. The overall experience reinforced what is perhaps obvious: this is a political trial, the outcome of which will likely not be decided on the merits of any arguments presented in the courtroom.